I want to thank Kirklands for partnering with me on this neutral fall home tour. All opinions are my own. Happy Monday! 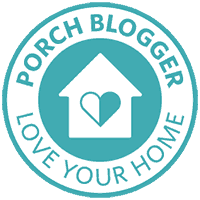 I am so happy that Deb, from Seeking Lavender Lane asked me to join this fall home tour blog hop! If you are stopping over from BlueSky At Home, welcome! Isn’t Carol’s fall tour beautiful? I am happy you are here and can’t wait to share our fall home with you as well. If you follow me on Instagram (head HERE if you aren’t), I took you along on my fall shopping trip to Kirklands. We used to have a Kirklands store in our mall years ago, but they closed it. A couple of years ago we got a brand new “stand-alone” Kirklands store in town. YIPPEEE! I loved shopping at Kirklands years ago and was excited to find out they were bringing it back. I am super excited to be working with them for our neutral fall home tour. I found so many pieces at Kirklands that I loved and really took some time to think about each piece. I had a pile that I would add to and take away from in the store. It was funny. The people working there were so helpful and were excited about the process and can’t wait to see it on my blog. I didn’t want to be impulsive in what I bought. 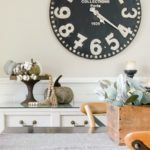 I really wanted things that were timeless, that I could use during other seasons and yet, pieces that would welcome fall to our home. 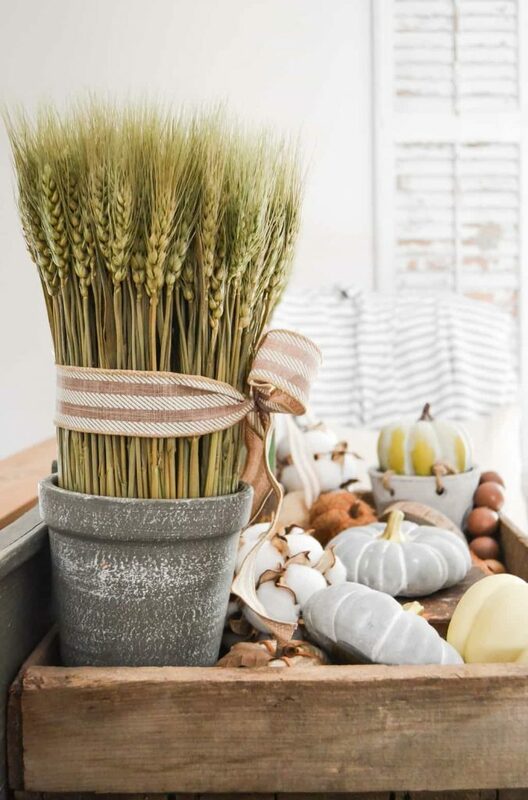 The first thing I fell in love with were these Dried Wheat Arrangements. I loved everything about them. They were natural, neutral and added the right amount of height to this little cabinet in our living room. These might be season specific, but I will leave them out through Thanksgiving. Then, I found the Thankful Tag and the Galvanized Vented Tin Tray. 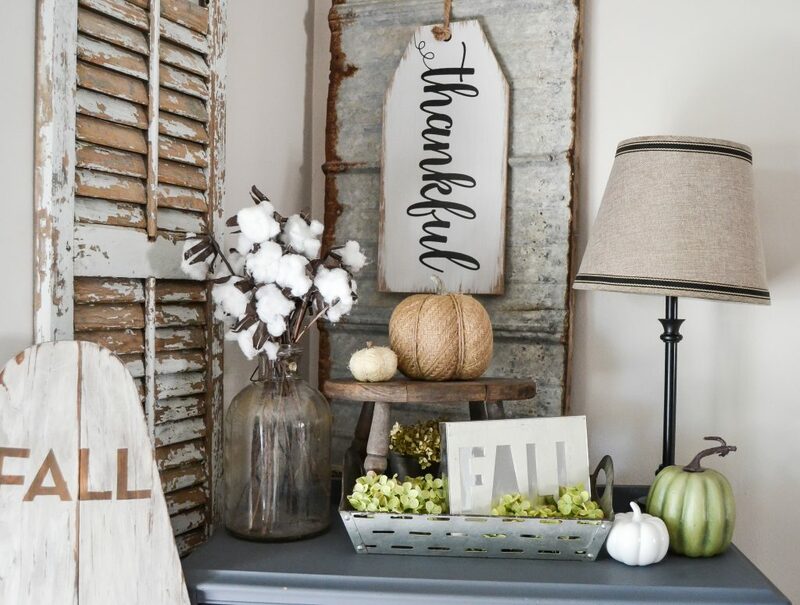 The tag was perfect for the galvanized piece we have on the living room wall and the tray is great for filling with fall goodness. I was going to hang it on the wall, but I didn’t have the right spot for it. I will be using this tray all year round. I always start decorating for new seasons and holidays in smaller areas. Last week, I shared my tips for styling coffee table easily. I used those exact tips to put our living room coffee table together for fall. I started by adding the Wood Tray With Beaded Handle to the old box I have always had on the coffee table. This tray is beautiful. I couldn’t leave it in the store. Any time I can picture a piece with multiple uses, it is a wise decor purchase for me. You aren’t stuck with it in one place. This beaded handle wood tray was exactly that. 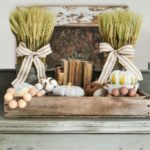 I see it with uses all year round, but for this neutral fall home tour, I added some of the Golden Natural Pumpkin Fillers, Cotton Orbs and the Balsam & Cedar Candle to it. The candle smells so good and any candle in a galvanized vessel is great in my book. I finished out the tray with my thrift store copper pieces and some candlesticks that Matt made from a wood spindle we had in the garage. 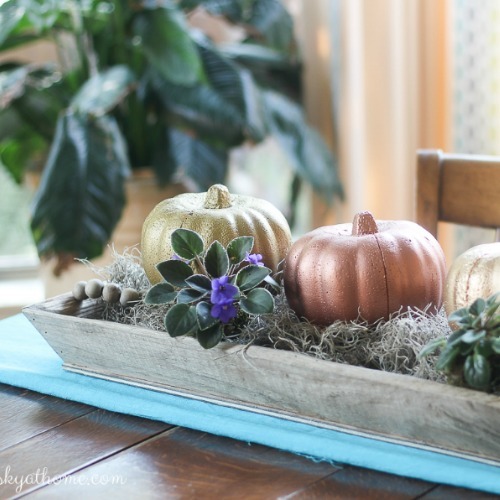 They were beautiful on our fall tablescape this year! My final purchase was the Geometric Sketch Embossed Galvanized Metal Bin . What can I say. Look at that thing! It has the best pattern and will hold so many things. I just loved it. It will perfect throughout the winter too. 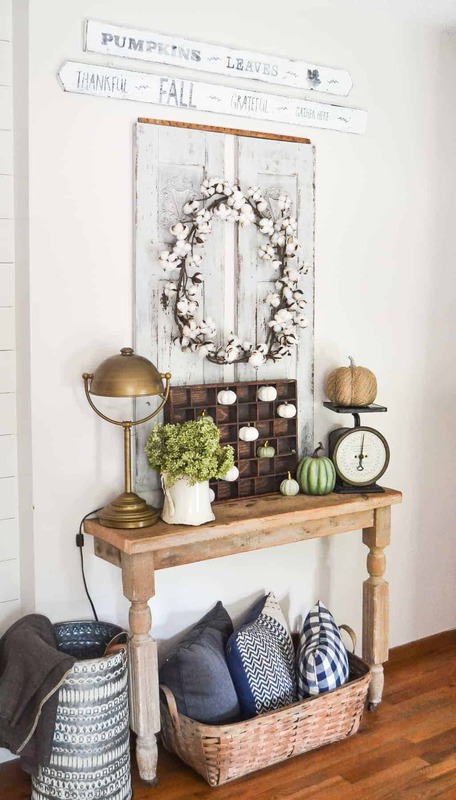 This neutral fall home tour means our house is ready for fall, but the weather is not cooperating here in Iowa. We had a few fall-like days, but the past week has been pretty warm. I long for cooler days when I am cozy in sweats and a sweatshirt all day. Until then, I will just turn the AC on, pull the sweatshirt on, pour a cup of tea, light my candle and enjoy the fall season that is happening inside. 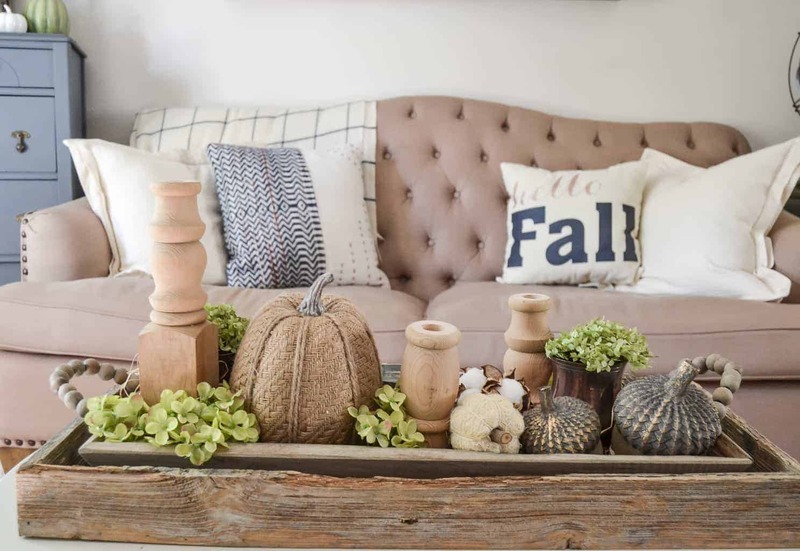 Is your home ready for fall? What do you like most about the season? I hope you enjoyed this tour! It was so much fun to be a part of. 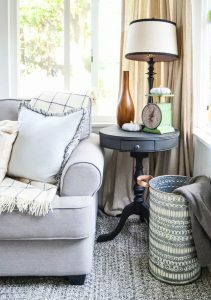 All day today, my blog friends are sharing their finds at Kirklands and how they added it to their fall tour. I love seeing how they envisioned the things that I saw or bought. Grab your favorite mug and take a minute to soak in all the fall goodness. 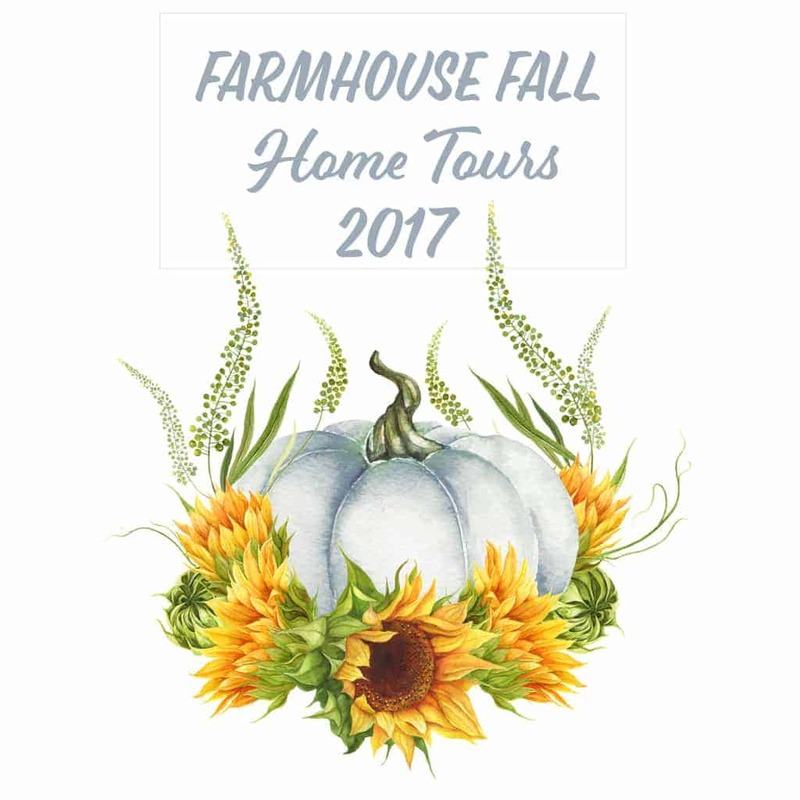 Head over to Little House Of Four to see her beautiful home and to see the rest of the tours, click the links below. Make sure to check back very day to see the new tours! I love the Distressed Natural Pedestal Console Table. It would look absolutely gorgeous in my entryway. This store has so much neat stuff. I love all the natural and washed wood items they have. I could go nuts in this store and turn my house into what I wish it would be. Lindsay, your home is so cozy and perfect for fall! I love your tufted couch. I don’t know what it is about tufted furniture but it always captures my heart. Love your home! Lindsay, love all elements of your fall decor. We both loved that wooden tray with the beaded handles. What a great find at Kirkland’s. All the signage is wonderful. You really have a knack for combining different elements beautifully. So happy to be on the fall home tour with you. Everything looks so beautiful, Lindsay! 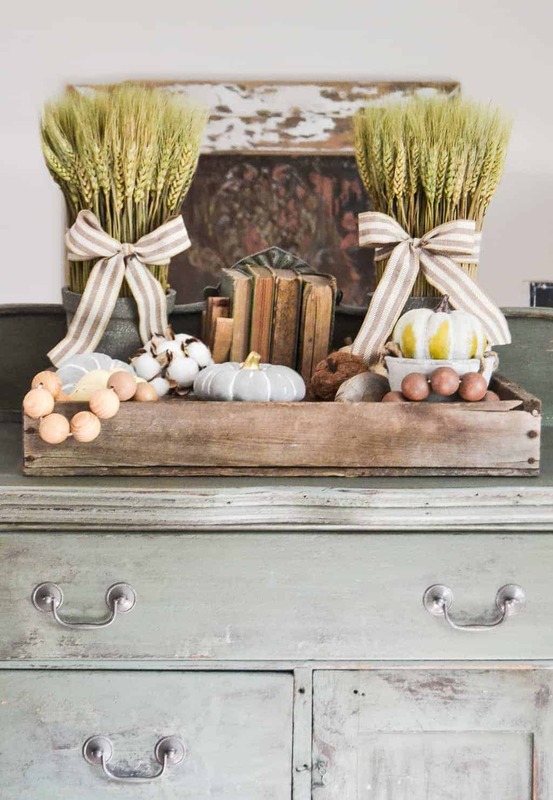 Love that tin tray….gorgeous! Happy Fall! I love this lamp: Dynia Silver Mercury Glass Table Lamp among many other items! Those are a great choice! 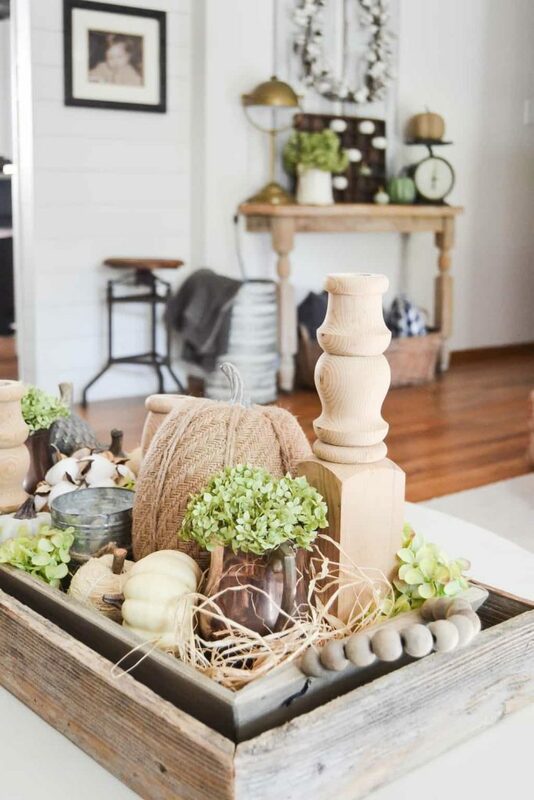 LOVE all of those pretty Fall touches! Everything looks SO perfectly cozy and that centerpiece is absolutely gorgeous!!! Very pretty! I really love the thankful tag. Your layers of fall goodness are beautiful! 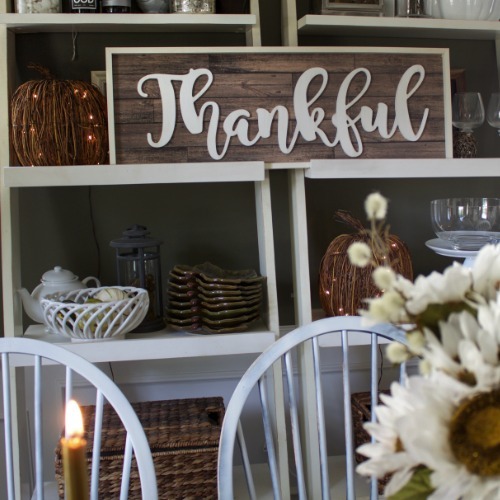 I think my favorite piece is the Thankful tag sign. It’s different. I also like the twisted stem pumpkins and a dozen other things. Thanks for the giveaway. Your welcome!!! Thank you for entering! I love your beautiful living room so much lindsay! 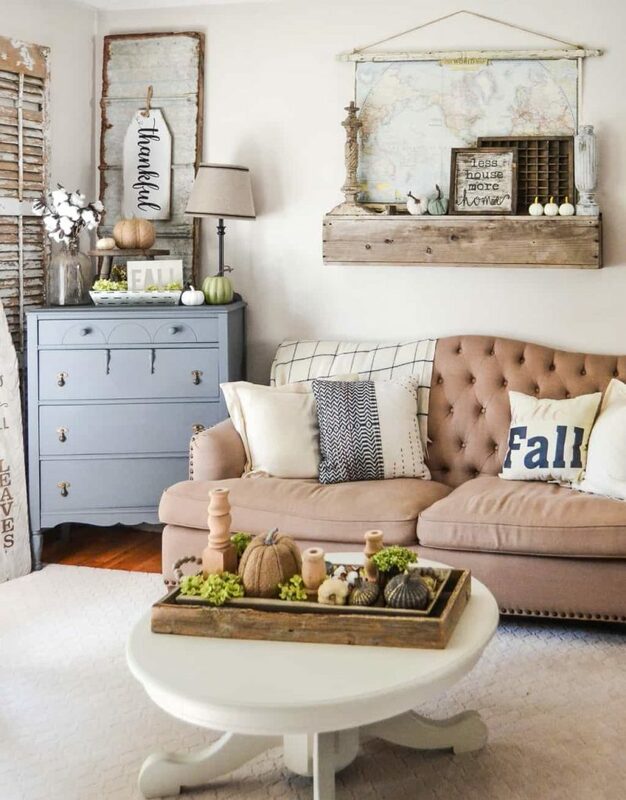 Super cozy and all your vintage farmhouse touches are perfect! I love Kirkland’s! It is my favorite place to shop. I have to do most of it online, since the nearest Kirkland’s is about 60 miles from my house. But, when I get to the city, I make sure to take time to stop in! I am never disappointed. I always find something to take home to add to my decore. I enjoyed all of your lovely fall decorations. You have such wonderful taste and I always come away with several ideas for my home. Happy Fall! Thank you Sue! I hope you entered the giveaway!!! $1500 can go a long way at Kirklands! Everything is gorgeous but I would really love one of the cotton wreaths. Yep! They go with anything! That is a great wreath! I know! This would be amazing to win!! 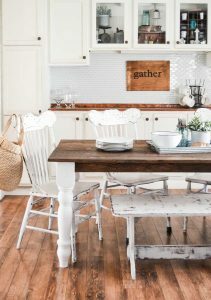 my favorite item is the Graywash Barn Doors Media Cabinet!! It is the piece i have been looking for!! I like the Gold Pre-Lit Mercury Glass Pumpkin. I like the Barnwood Highboy Fireplace Media Cabinet. I LOVE all of your rustic farmhouse accents, beautiful fall home tour! Pinning! My favorite is the set of 3 ceramic pumpkins. Ooooo I love that bin! It’s awesome and will be perfect for holding so many items! Your room is beautiful! I love your tour! The hints of blue are totally my style which makes me love it even more! So glad I got to blog hop with you yesterday! Kirkland’s is my weakness – most of my accent furniture and decor comes from there. I really like the Bless our Home Framed Art Print. That is a great print! How did I miss those wheat arrangements? They are precious. 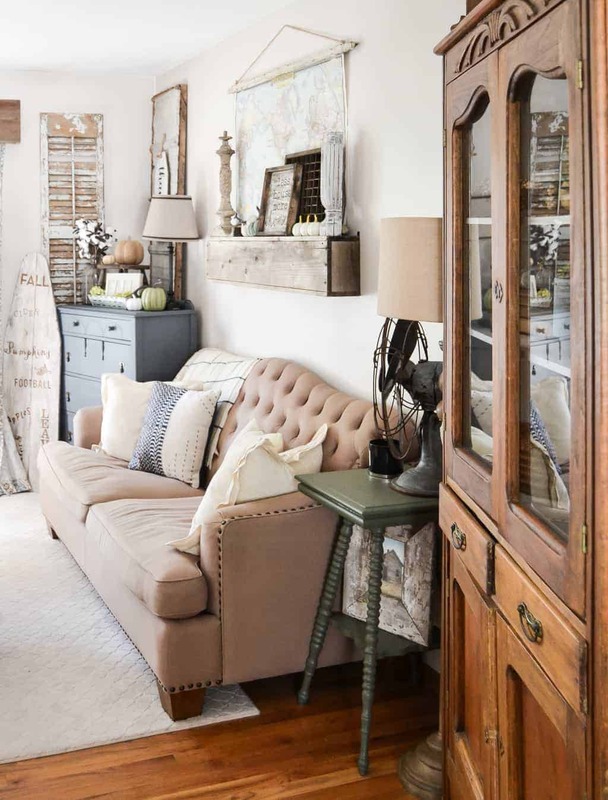 I love all the layers and textures in your home, it is so wonderful!!! This turned out so pretty, Lindsay! I love the neutral color palette! 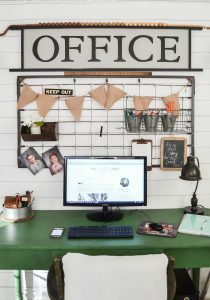 I am absolutely loving the Rolling Barn Door Chalkboard Wall Organizer! I love the Give Thanks porch board. So cute. I love so many items. I really like the color infusion torchiere floor lamp. I love the map everything is stunning! 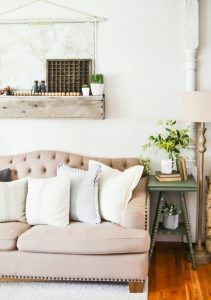 I love how you know what you are doing with different textures and layering, your home is so interesting and inviting! Just beautiful. Beautiful Lindsay! You put together the prettiest vignettes. I just love those potted wheat stocks! Love all of this! Can I ask where the rolled map came from?? Wow you are a styling genius!!! 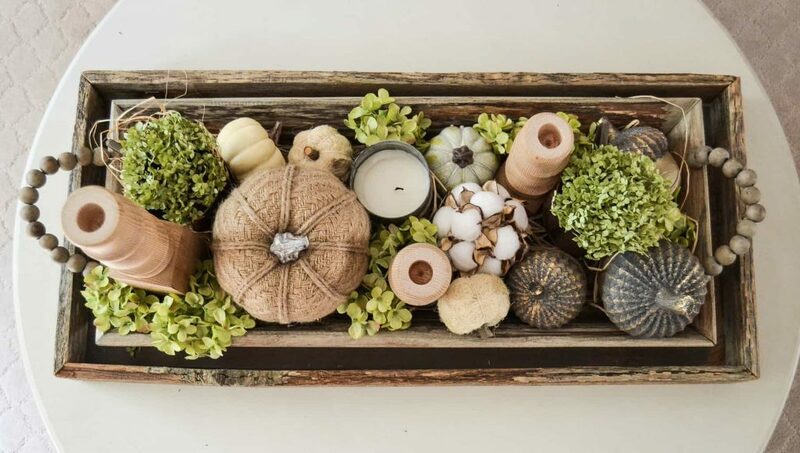 Love all your fall decor!! So much fun doing this tour with you and I too LOVE neutral decor! Wow! I love it all! Your color pallet is amazing! 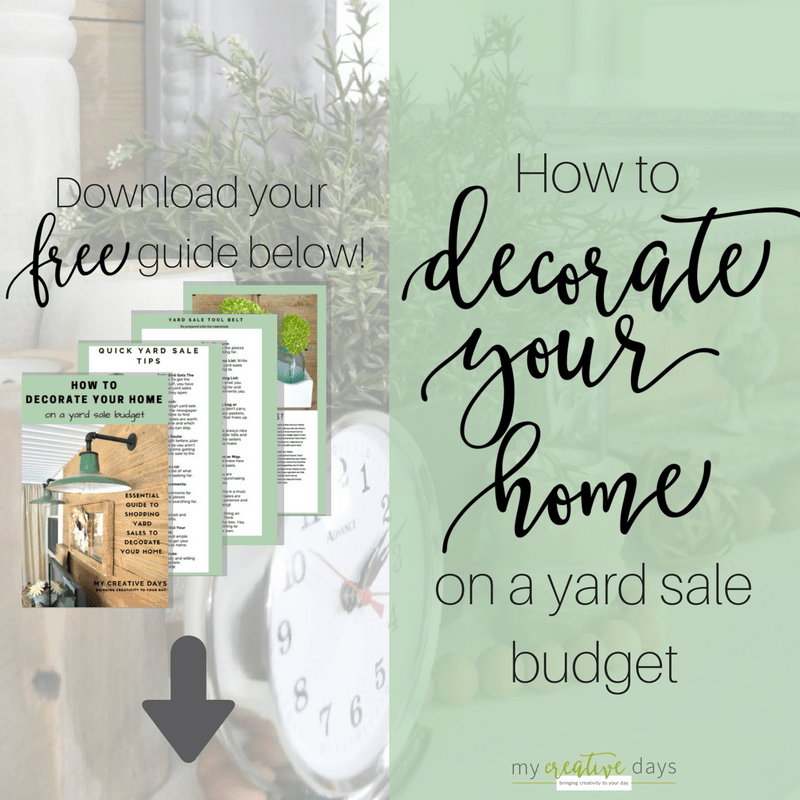 I love that galvanized bucket! And those wheat stalks are everything. Thanks for a wonderful tour! I am LOVING the new Dortha Vintage Medallion Area Rug! My husband and I need a new rug for our home AND for a music studio that we are building at our church! I like the Rust Red Classic Cable Knit Stitch Throw Blanket. The Balsam and Cedar candle looks great. So do all the holiday scented candles! Oh my gosh it’s all so welcoming and cozy…and I love the cotton bolls! This is a link to my favorite: http://www.kirklands.com/product/Outdoor/Outdoor-Furniture/Outdoor-Sets/Dark-Acacia-Wood-Outdoor-Dining-Set-Set-of-6/pc/3011/c/3012/sc/3015/220086.uts This is the Dark Acacia Wood Outdoor Furniture Set with 6 pieces. Love this! I cannot express how much I LOVE Kirkland’s! It’s hard to pick just item, lol! One item I seen that I really like is their Single Silver Teardrop Panel Mirror. I really like their Pumpkins Please Plaid Pillow. So tough to choose, they really have some beautiful pieces for fall! This pillow is cute, simple and really gives the sentiment of the fall season. I also like thise wheat arrangement and your sofa! Is that leather? Where is it from? It is not leather. We got it at TJ Maxx years ago on clearance! It was such a great deal! I love rugs and I lkie th Zigzag Painted 8 by 10 area rug! I would love to get the Brown Cantaliever Patio Umbrella for the patio seating area. 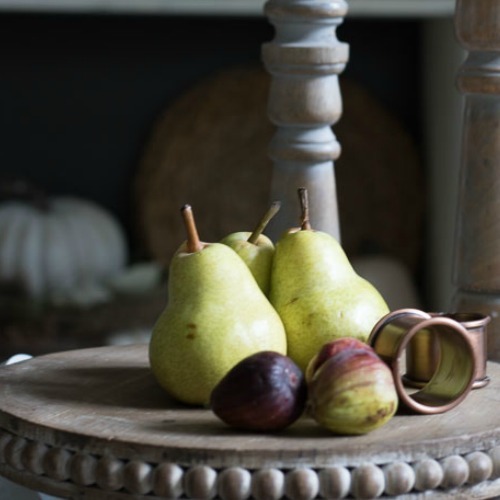 Follow @kirklands AND participating fall home tour bloggers on Instagram. I dont understand this one.. wish I did. I cant tell who the other bloggers are :/ I follow a lot of you and still cant figure it out. Lovely prize! Thanks! Kirklands set up the giveaway link?? Sorry you are having trouble. It doesnt specify what other bloggers are to be followed…. no links nor names. Can you tell me what others are there besides @kirklands ? I dont know how anyone can take this entry without knowing. I am following kirklands and have been. Kirklands set up the giveaway. You should be good with following them. Fairlea Cordless LED Wall Sconce is so pretty love a pair of these for my bedroom.